Between the town centre and sea front lie the Morrab Gardens - three acres of renowned sub-tropical gardens which are home to a surprising variety of plants, shrubs and trees which thrive in the mild climate. Some of the plants grown for over a century here include magnolias, camellias, tree ferns, palm trees, and banana plants. 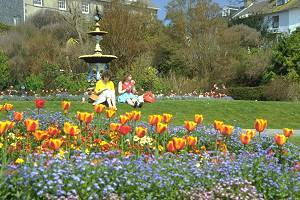 Close to the Morrab Gardens are the Penlee Memorial Park where fifteen acres of open parkland host a small open air theatre, tennis courts, children's play area, an adventure park and a football field. Located within the Penlee Park grounds is the Penlee House Gallery & Museum. On the outskirts of the town, about two miles north and near to the village of Madron are Trengwainton Gardens - owned and managed by the National Trust. 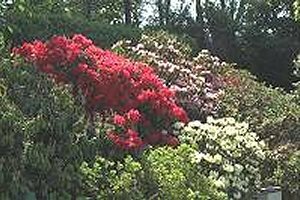 Here there are spectacular displays of rhododendrons, azaleas and other plants from the Far East, New Zealand and North America all in the grounds of a large mansion. Three Penzance charities, The Hypatia Trust, The Friends of Morrab Gardens and the Pengarth Day Centre, are presently working together to renovate the Morrab Gardens' derelict stables and create 'The Gardeners' House' - a new learning centre for botanical and horticultural projects, a natural history reading room, lecture hall, an open air laboratory and communal activity spaces.